Working with retail outlets to make healthy changes to the foods and drinks they offer doesn’t need to be difficult. Use the information below to help you work with retailers that provide meals, snacks and drinks for staff and visitors in your organisation. What are the guidelines for healthy retail outlets? RED choices are not promoted or displayed prominently. RED choices (like sugary drinks, confectionery or deep fried foods) should not be supersized, and should not be included in specials like meal deals or ‘two for one’ offers. Some retail outlets stock mostly packaged products (e.g. kiosk) and some make most of their foods and drinks on-site (e.g. café). Having a good understanding of the type of outlet you are working with, and the way the outlet operates, will help you work with the outlet to make healthy changes. Having this information will help you negotiate with the retailer and will help you work out whether you can switch to a new retail provider if needed. If you have a contract with an on-site retail outlet, you can include a service agreement in the contract which states that the outlet needs to meet the Healthy Choices guidelines. This will help make sure your efforts in providing healthier choices are sustainable and embedded across your organisation. This is easily achieved if your current contract can be changed or is about to be renewed, or if you are getting a new retail provider. If you have a contract with an outlet that cannot be changed and is not up for renewal, you should encourage the outlet to make healthy changes before the contract expires. If you are working with an on-site retail outlet, but there is no formal contract in place, this is an excellent opportunity to sign a new contract which includes requirements for providing healthy foods and drinks. If your organisation is putting out a tender for a new outlet, make sure that requirements for providing healthy foods and drinks are included in the tender specifications. encourage staff and visitors to ask for healthier options from the outlet. You can find out how the food and drinks offered in a retail food outlet are classified under the Healthy Choices guidelines, with a free online menu assessment. 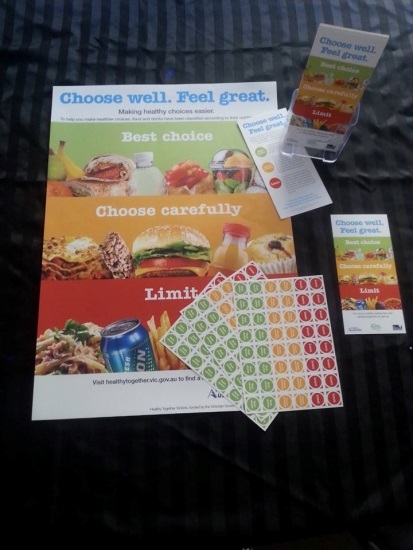 If you are making changes towards meeting the Healthy Choices guidelines, you might be eligible to display the Healthy Choices signage. Find out more here. Encourage retailers to visit our Food outlets, caterers and vending section for menu planning resources, healthy food and drink ideas and recipes.